Unfortunately shoes are the main reason of disorder in any room. Of course, if you don’t want to go around this question, you can keep shoes under your bed. No one can see them, but you will spend plenty of time in search of one or another pair of shoes. 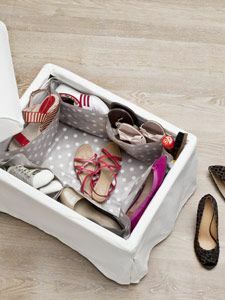 We have gathered several interesting design ideas that will help you organize your shoes and keep them neatly organized. Some of them are cost-effective and some of them are rather expensive. So, let’s start! This is the cheapest way to store shoes organized. Besides, this method allows you to display your collection of shoes. The time you spend on search of one or another pair of shoes will be reduced to the minimum. This method will be suitable for those who look for cheap alternatives to keep non-seasonal shoes. In doing so, shoes you are not wearing at the moment will be kept out of your way. This is one more cheap method to keep shoes organized. You can buy a simple, metal shoe rack and cover it with the curtain. This variant will be suitable for those who reside in a small flat, but wish to keep shoes neatly organized. 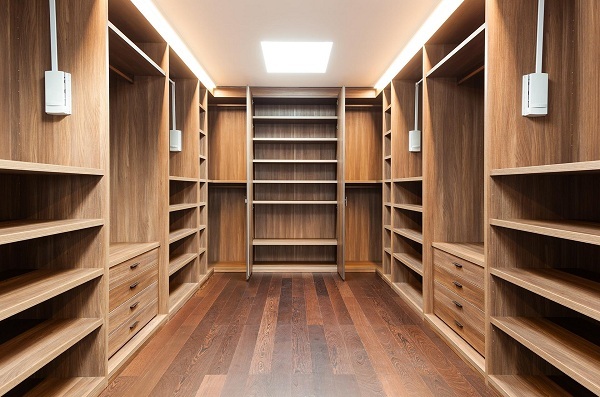 The best method to keep all clothing items neatly organized is to order a walk-in closet. To do this, you should have a spare room in your house. Ordering a walk-in closet, ask the designers to add a shoe rack. ClosetSolution, a well-known Canadian company, specializing in providing customers with storage systems, can help you choose the best shoe rack for your house. Besides, the designers will project a walk-in closet for you, following your requirements. You can see the example of a walk-in closet with shelves for shoes, projected by this company on the image. Probably you have vintage shoes or some other rather expensive pairs of shoes and you don’t want to hide them in a closet. With this idea, your shoes may become a very attractive accessory of your bedroom. These wall-shelves can be installed in any corner of the room. This idea will be appreciated by parents. This baby shoe rack is your chance to forget about a cluttered baby room. It can be either displayed or hidden in a dresser. Ottomans are multifunctional furniture items. 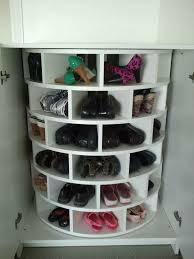 Besides, you can easily keep non-seasonal shoes there. Looking for interesting and original ideas? This one is what you really need. Lazy Susans work for shoe organization too. Besides, with this shoe rack, your collection of shoes will never be in the back. The solution for shoe-a-holics like me!